A few months ago I started to keep a running tally in my blog’s right sidebar. It lists the books I’ve just read. I don’t think I’ve ever commented on that in any of my posts, and I can only recall one time that I’ve written about one of those books since I started to list them. 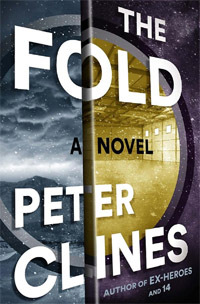 But this week has been exceptional so far, starting with Peter Clines’ The Fold and continuing with Scott Hawkins’ debut novel The Library at Mount Char. In The Fold, we follow an independent contractor who’s hired to analyze a secretive scientific project that’s built what its creators call “The Albuquerque Door”. The Door is the end result of their experiments in teleportation. Those experiments ground to a gruesome halt when an animal experiment went wrong; but the team recovered, changed the direction of their research, and now have what seems to be a completely functional and safe teleportation system. They just won’t tell anybody how it works. Hence the independent audit of their program. Now, the first twist is going to be a pretty obvious one. You’ll have figured it out after the first chapter. The characters (who don’t have the advantage of knowing that they’re in a book) will take quite a bit longer to get there. Is that tedious? No, not at all, especially when it turns out that that twist isn’t what you thought it was, exactly, and – oh, look! – things just keep getting stranger until you (and those characters) find yourself someplace you never thought might exist. Once you’ve found it, you’ll want to get the heck out of there as quickly as you can. If you can. Because of what’s been waiting there. 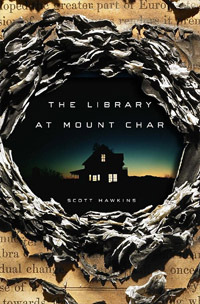 Scott Hawkins’ The Library at Mount Char is a very different kind of book. Twelve children were adopted, years ago, by someone they know only as Father. Father is a kind of head librarian in a library that has twelve catalogs, or fields of study. Each child is assigned to learn one of them. Father, as you might expect, has mastered them all. The children are raised to adulthood and the mastery of their own catalogs before the story really begins: that is, when Father disappears. If the library’s catalogs are out of the ordinary, they’re nothing compared to Father’s child-rearing technique. Discipline is harsh. Because one of his many talents is the ability to raise the dead, Father’s discipline can be fatal without being final: and so it is, very often, and in completely horrific ways. As a result, most of the adults who were the children are not people you’d really like to know. This book (which I think is remarkable) won’t be for everyone. There are really, really awful things in here, and quite a few of those things happen to the children. But not only to the children. When Father vanishes we start to see that he had powerful enemies who aren’t any more human than he was, and at least one enemy who is much more human than he was. The entire world enters into a period of chaos and disaster as the survivors struggle to find Father or take his place. And that’s a challenge: one reason why it’s so hard to fill Father’s shoes is that he’s been wearing them for more than sixty thousand years. While the central mystery may seem at first to be “Who and what is Father?” that’s not really what the book is about. It’s much more about revenge, and the cost of revenge to the avenger, and whether that cost is irreparable. Add a dash of “What does it mean to be (nearly) human?” and simmer gently over sacrifice, bravery, a surfeit of power, and all of the damage done. Enjoy till the finish. You’ll never think about the Sun in the same way again. Also: lions. Just the most amazing lions. 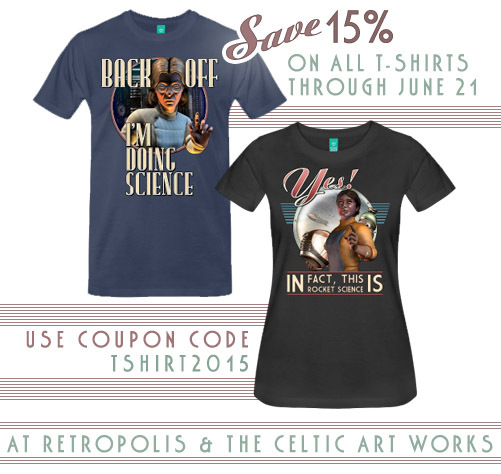 Yep, it must be t-shirt season again, because through June 21st you can save 15 big old percentage points off the price of the t-shirts at Retropolis and The Celtic Art Works. That’s five more percentage points than ten! So whether your taste runs to giant robots or to knotwork Cthulhu, I’ve got something, somewhere, to get you covered. And, yes: please do that. Think of the children! In arguments, as in most things in life, there’s a decided advantage to being a Giant Robot. I don’t claim that this is fair. Some of us, despite our rigorous attention to logic and rhetoric; despite our faithful attendance at the debate club; completely without reference to our careful preparation and well-reasoned arguments, were simply not born with gigantic cannons mounted in our chests. Through no fault (or merit) of our own, our fists are not five hundred pound mallets made for mayhem. It’s not a level playing field, in other words. All I can say is: buck up, keep a stiff upper lip, and be prepared to run through the streets while you shriek like the teakettle of doom. I nearly didn’t complete this one because it could be too true to be funny. 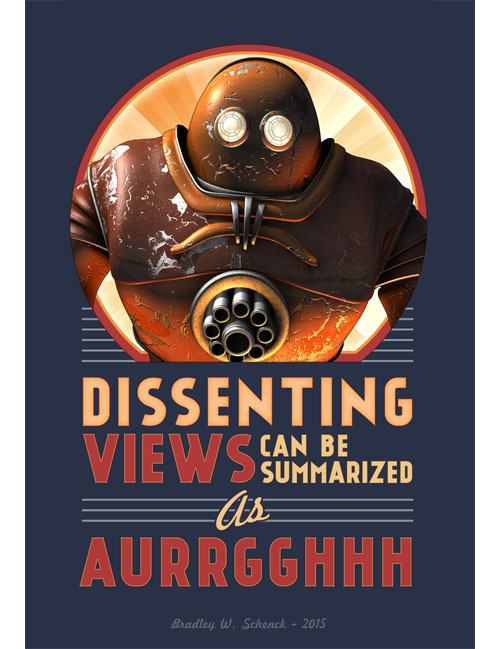 But I did complete it, possibly to make sure that even argumentative Giant Robots can have their day, their t-shirt, and their poster. And since Giant Robots come in every size, shape, and disposition, there are shirts for men, women, and kids. Please remember, though, that even if you have fists like five hundred pound mallets made for mayhem… you don’t have to use them.